Fox Metro has partnered with the Kiwanis Club of Aurora, City of Aurora, Aurora Township, Fox Valley Park District, and other local agencies in conducting what we hope will be another successful cleanup event. Portions of the Fox River from Ashland Avenue to Illinois Avenue, including various Fox Valley Park District park locations will be the target area this year. Headquarters will be at the Cole Center located at 101 W. Illinois Ave. The Kiwanis “One-Day” objective is to unite volunteers to participate in a hands-on service project to better our community. At the last cleanup event in 2018, there were over 400 volunteers who helped remove trash from in and around the Fox River, as well as north and south of downtown Aurora. 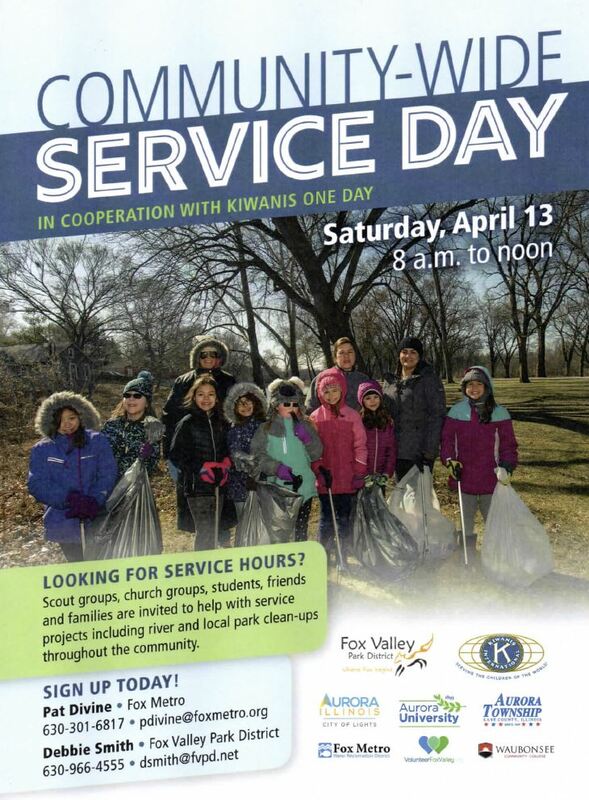 The goal for the Fox River and nearby Fox Valley Park District locations this year is to have many dedicated volunteers come together once again to impact our community on April 13. Check in: 8 am at the Cole Center located at 101 W. Illinois Ave.
Breakfast snacks will be available after check in and an appreciation lunch will conclude the event. Medication Takeback: Fox Metro will be present at the Aurora Transportation Center Parking lot (north end) collecting expired and unwanted medications. The mission of Fox Metro is to prevent improperly disposed of medications from entering our water ways. Use this opportunity as one more way to protect our environment.